So the food … there is a long list of the usual tandoor, curry (mild to spicy) and about 20 starters. We wanted to order but ordering was slow. First we were left for 5 minutes without taking our order for drinks. Then we had to wait for another 10 minutes before ordering even though when the drinks came we said we were ready. So do not come for fast food but it did allow us to take in the view – the other two customers. 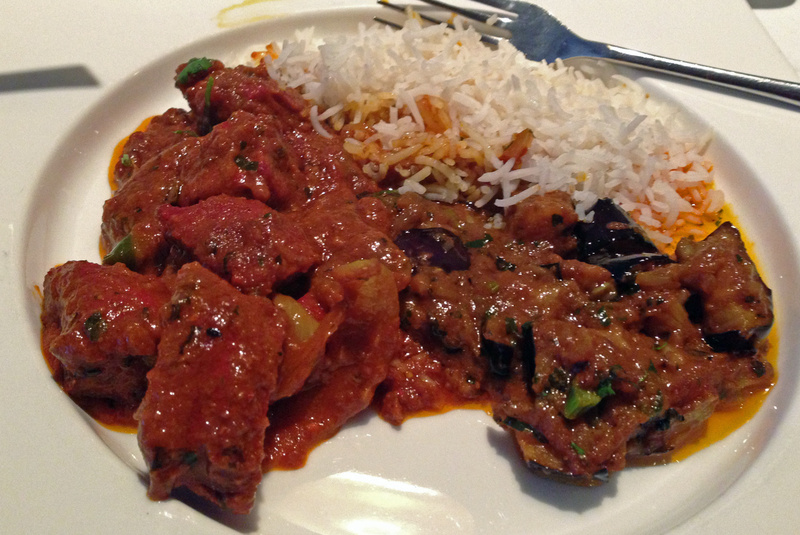 We chose from the chef’s specials with butter chicken and lamb chilli masala with plain rice and brinjal bhaji. We felt we should have come in a bigger party so we could have tasted more of their list. 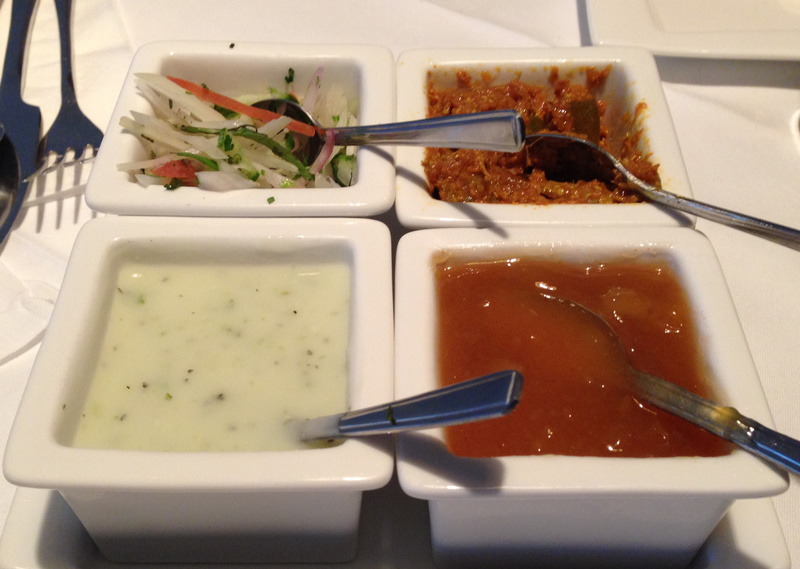 The papadoms to start came with a set of condiments – again in four white china containers. I particularly liked the yoghurt dressing and there was no stinting on the amounts provided. I have been trying to identify the same butter chicken I had first in Delhi but this wasn’t it. It was slightly spiced and had a little fire but I was expecting a more buttery taste with more almonds. Despite the restaurant being linked to one down Coldharbour Lane the butter chicken was different with this one being much superior. The brinjal baji was oily but well cooked. The lamb was fine but nothing special. We washed both down with small bottles of Cobra and Kingfisher beer. The whole meal was £30.00 and we were delighted to find that their system works out the per person price on the bill. This will definitely be a good place to come with a crowd when no-one can work out where the calculator is on their phone. Given the debate about finding a good Indian restaurant in Brixton we were surprised at the hype. This is a perfectly competent Indian restaurant that we will try again with a larger party. If you want to have stylish surroundings and feel it is a bit special then this is somewhere to come. But it wasn’t as good as we had hoped.